"I came late to ceramics: my interest had always been in books and the written word, poetry and the spoken. When I started working with clay, it was initially as an antidote to a stressful day job. Slowly I began to understand and develop a new visual language - one equally steeped in tradition, context, narrative, humanity. I grew up a farmer's daughter in the Welsh borderlands, surrounded by fields of sheep and cattle, a backdrop of mountains and rock and the daily hardships of making a living on a small hill farm, punctuated only by school and chapel. Those rhythms - the distinct seasons, work on the farm, the ever- changing light on the mountains and a deep love of the land and its people now inspire and inform my work. 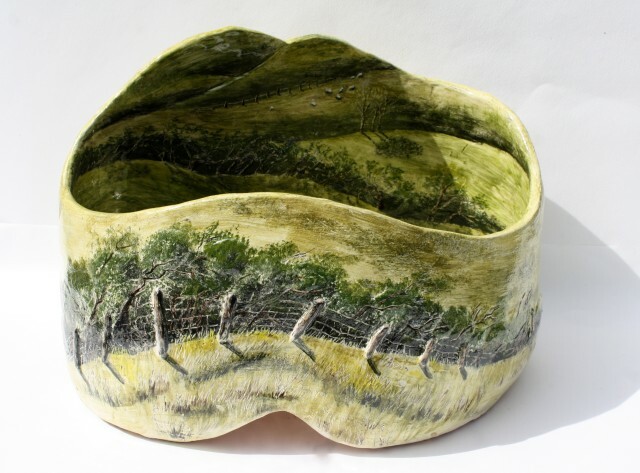 During my time at North Wales School of Art and Design, graduating with first class honours in 2010, I began my journey of making in response to both the remembered and the immediate experience of living in Wales. That journey continues. There's more than a bit of R.S. Thomas in there and no doubt other writers too. The slow hand-building of the larger forms in a grogged stoneware clay that I make now, allows time for consideration of form and surface and the development of narrative and rhythm. For me, it's about celebrating and sharing that magic of story, light and landscape that's all around us here." Helen's debut exhibition with us will be August 2019.